There may be times you are uncertain and feel the need to check with your Doctor. Doctors are trained to identify disease or pathological conditions but are not experts in simple musculo-skeletal pain (things wrong with your bones, ligaments and muscles).They may be able to refer you for physiotherapy or sometimes osteopathy on the NHS, but more often you may have to consult a practitioner privately. 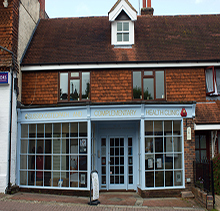 The divide between mainstream medicine and complementary health is hopefully lessening with the regulation in place (see General Osteopathic Council), but sometimes you may find that your G.P is not supportive of complementary medicine. Remember this is your decision and masking the symptoms will not get to the root of the problem. If you start developing a problem in your bladder or bowel. If you experience a loss of feeling between your legs that you've never experienced before. If you have severe pain or loss of sensation that you have never experienced before. If you experience any weakness in your arms or legs that you have never experienced before.